BlackBerry Messenger 5 now available | BlackBerry Blast! BlackBerry Messenger 5 is now officially out. You can get your copy at the BlackBerry App World or download it over the air at www.blackberry.com/messenger. The news Messenger works on BlackBerry OS 4.5 or higher. Many of the new features have been seen in a previously leaked version of the BlackBerry Messenger, but according to engadget there are many more tweaks and fixes in the official release. 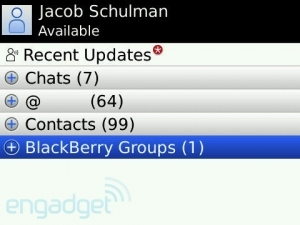 Check out engadget's review of BBM at the Source link below.